License plates are finally here. Starting January 15, 2018 NH firefighters and NH Retired Firefighters can purchase official decals from the NH Fallen Firefighters Memorial Committee. These are the ONLY decals recognized by the state to be placed on a NH Decal plate. 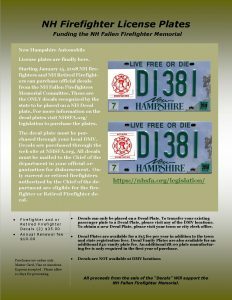 For more information on the decal plates visit NHSFA.org/legislation to purchase the plates. The decal plate must be purchased through your local DMV. Decals are purchased through the web site at NHSFA.org. All decals must be mailed to the Chief of the department in your official organization for disbursement. Only current or retired firefighters authorized by the Chief of the department are eligible for the firefighter or Retired Firefighter decal. Decals can only be placed on a Decal Plate. To transfer your existing passenger plate to a Decal Plate, please visit any of the DMV locations. To obtain a new Decal Plate, please visit your town or city clerk office. Decal Plates are available for a $15 fee per year in addition to the town and state registration fees. Decal Vanity Plates are also available for an additional $40 vanity plate fee. An additional $8.00 plate manufacturing fee is only required in the first year of purchase. Purchases are online only . Master Card, Visa or American Express accepted . Please allow 10 days for processing.